I learned something recently about people. 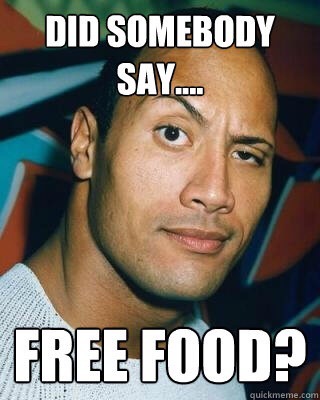 We all love free food. 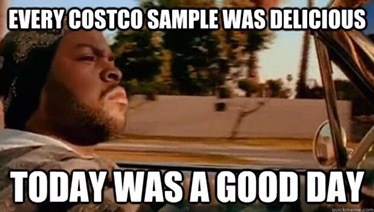 Not just the samples that Costco hands out. Holy smokes, wandering around Costco can fill you up at lunch… I suppose it would be polite to listen to their spiels about the product, then as you eat it, pretend like you’re going to buy it. I like to sneak up while someone else is there listening, reach over, grab a sample and continue on my way. There are so many more tables to get through people! Anytime you can go to a restaurant, and not have to pay, is one of the greatest pleasures in life. Enjoying an appetizer on the house or a free dessert has always enticed me to return. Eating free food at work has to be the greatest. It tends to boost morale and productivity. However, like any good thing, moderation is the key. You don’t want to be “that guy” who eats all of the chocolate chip cookies or eight pieces of pizza. I usually tend to grab an extra soda for later because most people forget about drinks while crowding around the food table. Now I’m hungry. Perhaps it’s time for an early dinner.